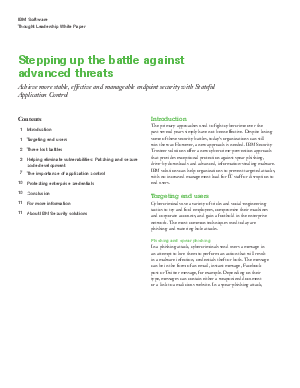 The primary approaches used to fight advanced threats over the past several years simply aren’t effective. Traditional methods such as user education, vulnerability patching, and malware detection have failed to protect enterprises against the current threat landscape. Attackers continuously develop sophisticated tactics and evasion techniques to bypass the latest protection methods, requiring the security industry to find a different approach to malware protection. Trusteer has pioneered a new cybercrime prevention approach that provides unparalleled protection against spear-phishing, drive-by downloads and advanced, information-stealing malware.